First iteration of a student desk. A bias towards action. That’s my new motto. It also happens to be the mantra of design thinking. When originally crafting the math rubrics I’ve been mentioning recently, I struggled immensely. In fact, the final product that I’ve posted to this blog was the result of several iterations and reorganizations of the same set of targets. I felt extremely frustrated by the feat and, at times, completely quit altogether, because I simply could not find a way to make my vision for multi-grade learning come to fruition. But each time I’d end up sitting down, a new piece would form, even if it was a piece that I knew I’d never use again. And therein lies the power of iteration: We won’t know what doesn’t work until we see it not working. This will be a rack for our backpacks! After all, the form of anything comes functionality the form with which we intend to create it, and by constantly reevaluating my purpose for building these rubrics–by failing fast, getting frustrated, and failing again–I ended up coming to an acceptable product, one on top of which I can build future iterations and applications to different standards and contexts. In fact, I already feel like I’ve been able to apply this new form to other math, reading, and writing targets. And if this strategy is good enough for me to learn on my own, it certainly will be good enough for my students. In fact, I think iteration is even more powerful when put in the hands of students. When we started the design project, I did as I normally do, and tried to exercise too much control over their creative process. We created a classroom map, which was successful to help them orient themselves into the room; after which, we began sketching and planning our designs. This element of the design process was not bad, in and of itself. It’s good to have an idea of what you’re going to try before you actually try it. My pitfall, however, was doing too much talking, and not enough acting. A prototype for our new shelves in the art studio. But one day, when our site lead came in to help, she asked where we were in the process. I mentioned we were designing using sketches, and that it’d be good to continue with that. I can’t remember what it was that made me change my plans; perhaps it was something she said, or perhaps it was because I felt absolutely befuddled by this crazy process upon which my class had embarked. Regardless, we changed the plans for the day and decided to just start building. She cut a bunch of cardboard, I prepped the kids, and then we started. The classroom seemed to burst with activity, and the kids milled about beginning to build their designs. One group, in particular, was constructing a rack for backpacks out of cardboard, while another began building individual desks. Others began working on a study space, while one final group began designing shelves for the art studio. Looks like we might need another iteration of this one. It seemed to be one of the first times that I wasn’t constantly putting out fires in the classroom. The kids were engaged, and the classroom had achieved its own level of flow. In this instance, in particular, it wasn’t because I was exercising my best classroom management skills (because, believe me, that’s necessary at times) or because I had bribed the kids to get work done with a reward. Instead, the kids were engaged because they were involved in complex interpersonal conversations–conversations where they problem-solved with each other and built upon the ideas of others. Not only that, they were involved in complex conversations with the cardboard itself. The cardboard served as a medium through which they were making our vision come to life; it served as yet another language for their hopes and dreams for a learning environment. They spoke through the cardboard, standing it up straight, slicing it in half, and adhering it to other pieces, making it take on its own life form. It spoke back to them, showing them that they’d built too tall a structure, too wide a structure, or too weak a structure–and what would they do in return? They’d iterate… and they’d try something new. This is my favorite of all of your blog posts. To me this passage is the heart of the post and describes an essential element of the model for learning we are trying to build: “It seemed to be one of the first times that I wasn’t constantly putting out fires in the classroom. The kids were engaged, and the classroom had achieved its own level of flow. In this instance, in particular, it wasn’t because I was exercising my best classroom management skills (because, believe me, that’s necessary at times) or because I had bribed the kids to get work done with a reward. 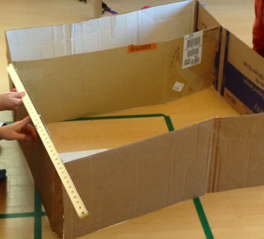 Instead, the kids were engaged because they were involved in complex interpersonal conversations–conversations where they problem-solved with each other and built upon the ideas of others.” These creations with cardboard were not something you could carefully reverse engineer so they could be assessed with neat rubrics. (altho you can assess how the students collaborated). To achieve this full and appropriate engagement you had to give the students control, stand back and, sometimes, sit with your own uncertainty. That is hard for everyone. But it is a beautiful thing! Design thinking doesn’t just occur in a design studio or a special hour of the day. It can be a part of learning in all subjects. Thanks for this! Thanks for reading and replying! It’s truly been a magical experience. Thanks for supporting it! It’s teaching me so much.